This is a repost from Ben Eovaldi, enjoy. The increased number of shark attacks on the East Coast of the United States is concerning for surfers in California. Fear of sharks may stop some people from paddling out into the ocean and deter others interested in learning how to surf from getting into the water. In general, we believe that fear of sharks has the potential to threaten our coastal ecosystem. The surfer’s passion for the ocean helps to protect it. Just one example of how surfers have contributed to protecting the coastline is at Trestles near San Onofre State Park in Sothern California. Surfers, environmentalists, and other groups successfully petitioned against a highway expansion project that would have disturbed the well-known surf break. Sharks certainly need protection because of their importance to a healthy costal ecosystem. But they do NOT need to be crashing the lineup and picking off surfers. There are some new products on the market promising to repel sharks and keep humans safe. But they are expensive and their availability at least in the United States is limited. More great white sharks may be showing up in California this year possibly because of increased water temperatures (El Nino – climate change). We would like to encourage more experts in coastal processes and oceanography to weigh in on the topic of shark repellents. So far, most of the expert opinions on shark repellents have come from Australia (1) and South Africa (2). It is important for people to feel safe about going in the water to maintain a strong human connection with the oceans. 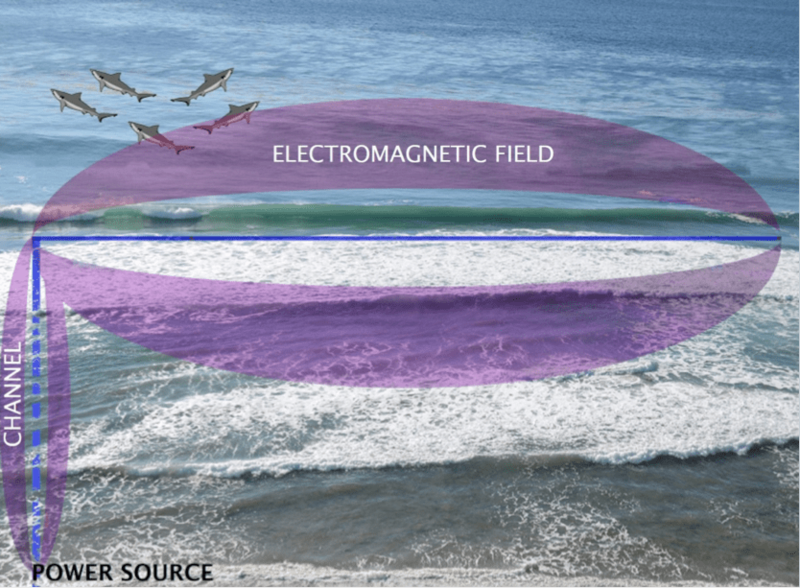 It would be interesting to see if a larger scale electromagnetic (3,4) shark repellant system could protect all of the surfers on a specific break. 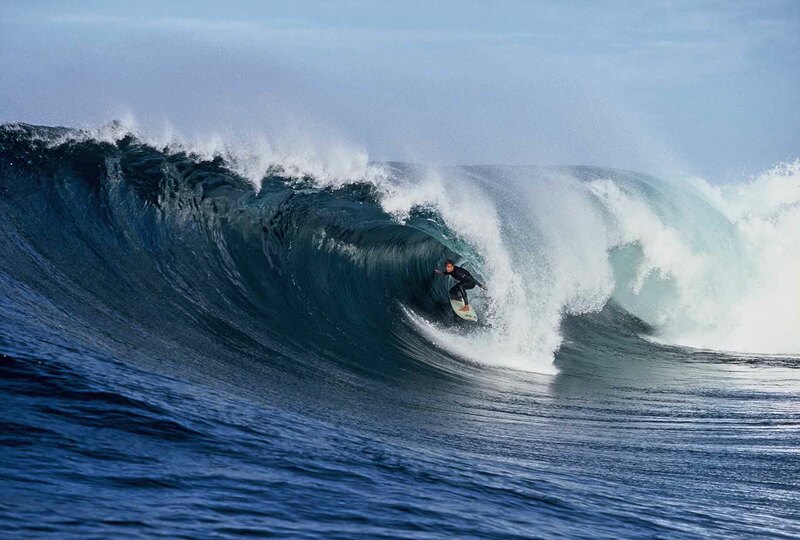 An international surf competition could be a good starting point for such a pilot study. But to do something like that we would need to hear what the environmental experts have to say first. There could be unforeseen harmful effects from exposure to electric fields on other marine life and humans. Below are some ideas for shark repellants listed – hoping to generate discussion. We would like to see what the thoughts and opinions are of the surf community, environmentalists, and regulating coastal authorities. 1) The zebra pattern (5) — Newer reports from the Southern African Shark and Ray symposium suggest that the orca pattern (6) may actually be a stronger shark repellant than the zebra pattern. Figure 1 shows a couple of our proposed orca patterns. 2) Would emitting orca sounds from surfboards, swimsuits, or the bottom of the ocean at surf breaks provide any additional benefit? 3) Expansion of the electromagnetic shark repellant to cover the entire surf break: Surfing can be a relatively inexpensive sport if you live near the ocean and learn how to repair your board. The need for an expensive personal electronic shark repellent (7,8) to feel safe in the water would change all of that. Maybe something like in Figure 2 could work as an effective public works project? We believe a safe method would be to tag all great whites with a sensor/transmitter capable of interacting with strategically placed shark safety beacons dialed into the same frequency of the great white tags. When the tagged shark gets too close to the beacon they get a shock and leave the area – similar to an underground electric dog fence. Hart NS and Collin SP. (2010) Shark senses and shark repellents. Integr Zool. 10(1):38-64. Collin S.P. (2010) Electroreception in Vertebrates and Invertebrates. In: Breed M.D. and Moore J., (eds.) Encyclopedia of Animal Behavior, volume 1, pp. 611-620 Oxford: Academic Press. Huveneers et al. Effects of an Electric Field on White Sharks: In Situ Testing of an Electric Deterrent Charlie. May 2013. ← 2015: Raffle Draw Results! My thought is this, if it’s strong enough to drive away Great Whites how good can it be for humans.